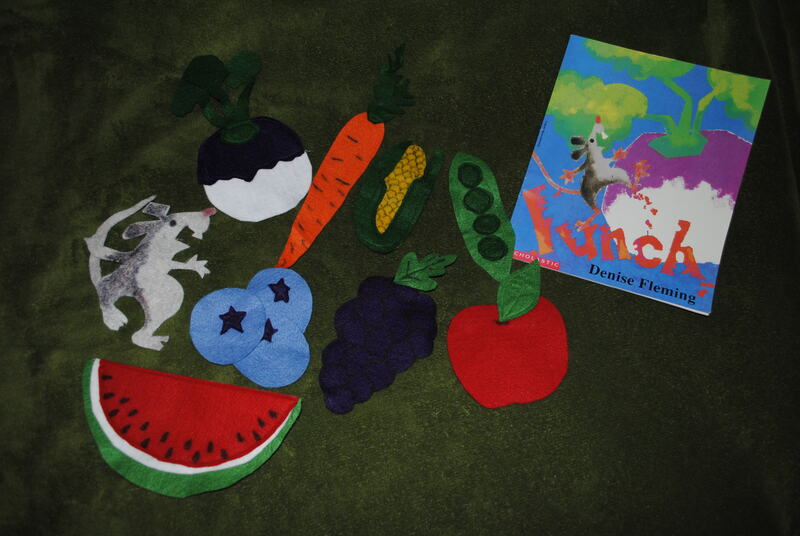 Food is an awesome theme for storytime because there are about 800 books, songs, fingerplays and flannels that fit. The only stress is picking which ones to use. So I’m going to list my favorites and how I generally use them. I’ll add my Toddler lineup and Preschool lineup at the bottom, I wish I could fit everything into the program each time I do this theme. Then again, changing it up keeps it fresh so I’m good. Now, I can’t eat THAT! 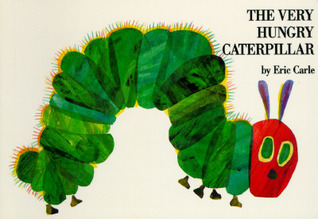 The Very Hungry Caterpillar (Carle). A modern classic if there ever was one. There is so much to do when interacting with this book. From the finger-in-the-cheek “pop” when the caterpillar comes out of the egg, to counting the food each day, to saying in unison, “but he was STILL hungry!” And we do them all. I’m always sure to point out that all of the foods the caterpillar ate along the way are represented in the colors of the butterfly – and we notice the pickle color and the plum color, etc. I read it straightforward for the Toddlers but for the Preschoolers, I purposefully mix up the words, say “shoes” instead of “pears,” “basketballs” instead of “oranges.” It cracks the kids up and they wait breathlessly for the next mistake. When I read all of the random food correctly, they usually applaud as if saying, “Good job, Miss Ann! We knew you could do it!” Precious. Then I mess up a few more times. It puts a new twist on a classic that they may have heard 50 times. 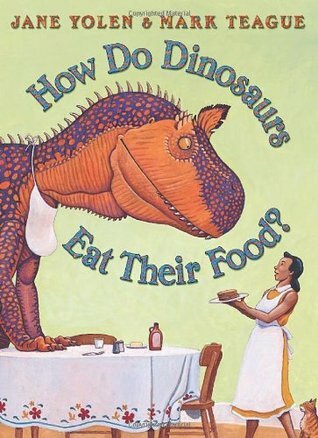 A great rhyming book that stresses manners with a sense of humor and giant colorful dinosaurs. The pictures are easy to see from far away and the idea of dinosaurs sticking beans up their noses makes everyone laugh. The whole series is good for storytime with How Do Dinosaurs Eat Their Food and How Do Dinosaurs Say Good Night being the most successful for me. You can be more interactive with the Preschoolers – they actually know that you shouldn’t squeeze oranges with your toes! 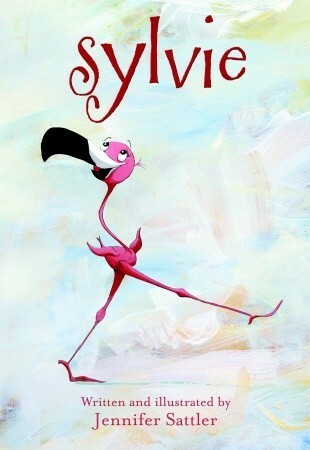 Sylvie is a flamingo that wonders why she (not to mention her whole family) is pink! It’s because of the pink shrimp they eat. So she tries lots of different snacks to see if she can change her colors – and she can! The preschoolers like finding the patterns and colors and also that she eats other things besides food. A swimsuit? Really? But of course she gets a tummy ache and decides that she likes pink best….but there is always dessert…..
One of my favorites – a sure fire hit in storytime. Unfortunately it is out of print. There is a Facebook campaign to get it published again. Anyway, it is a great book full of opportunities for the audience to play along. 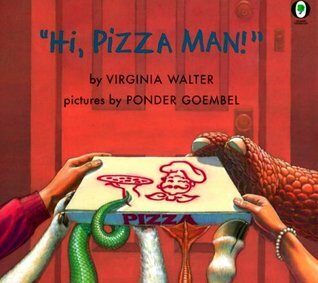 You go through a whole gamut of animals that might be delivering your pizza – getting progressively sillier. And then the doorbell rings. I play a guessing game with the kids as to who it might be. We even throw in a few more animals. It’s such a natural story extender. This is one that I read for the pure joy of playing in storytime. We don’t have many in the system so not everyone will get to take it home that week – but everyone will have the experience of stretching their imaginations and enjoying a book together. If you ever find a copy of this for a reasonable price – get it. You won’t be sorry. This one is very funny! The kids will relate to the thoughts going through this crocodile’s mind when he accidentally swallows a seed. 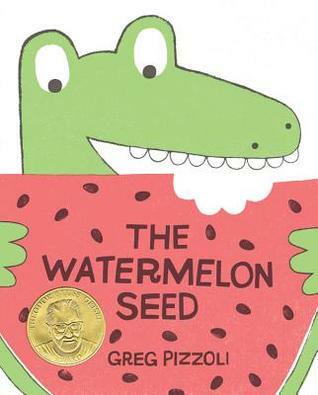 Pizzoli won the ALA Geisel Award for this charming bit of silliness and the kids love it, too. Bonus: Lots of chances to make chomping noises. 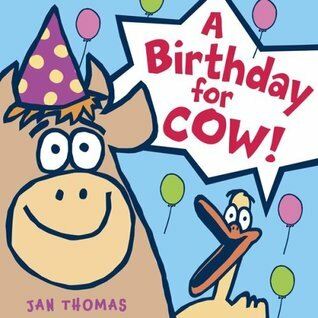 Jan Thomas is a genius and everything she writes is gold in storytime. So you know this one is going to be hilarious. I read this one with an exaggerated voice for Duck because he is just. so. enthusiastic! I’ve been using a version of this game for years but I don’t do it every week- so it stays fresh. 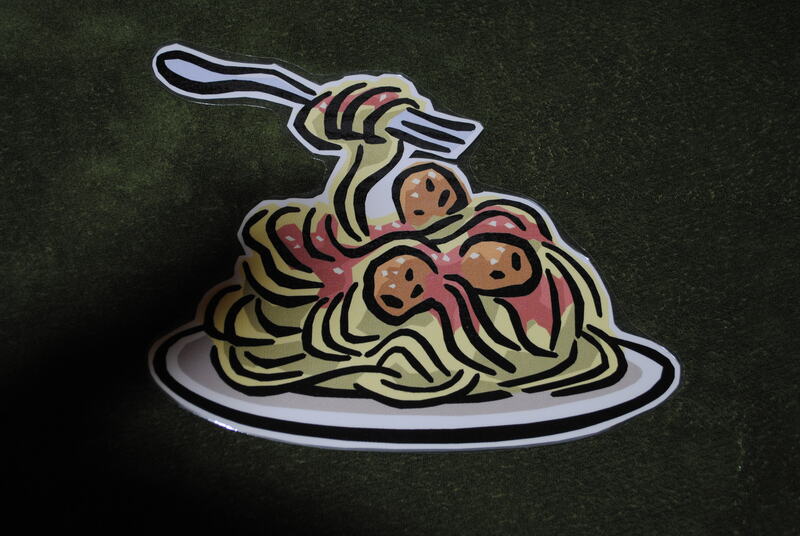 The wiggle worm cards are laminated so they stand up to lots of use. 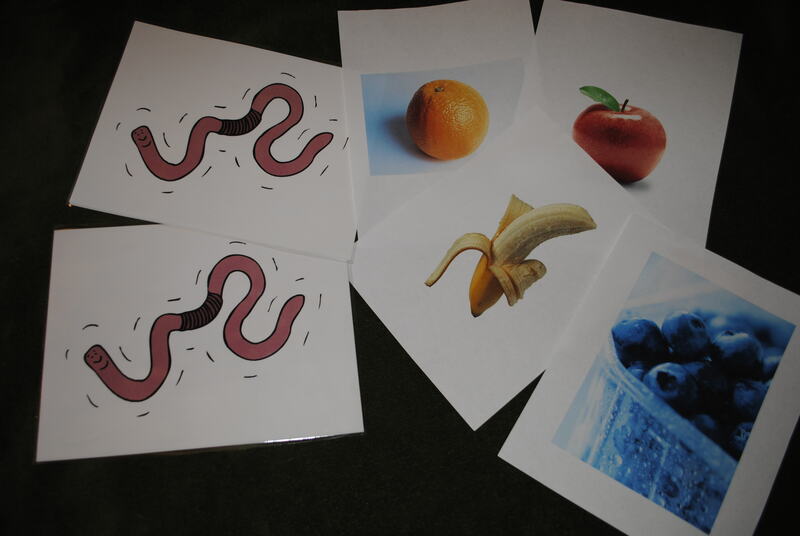 The color pictures (fruit in this case for the food theme) are just printed from the color printer on 8 1/2 x 11 paper. I created them in Publisher and picked about 8-10 photos to print, and then made doubles of 3-4 more. I’ve made several sets of these sheets: Things that Go, Fruit, Bedtime, Wild Animals and I keep them clipped together in file folders. The game is this: Interfile the wiggle worms in among the picture pages before storytime. For example – wiggle worm, orange, banana, apple, wiggle worm, blue berries, pineapple, pear, wiggle worm, grapes, banana, wiggle worm, lemon, wiggle worm – when it is time to play, hold up the pile and say, “Let’s play Wiggle Worm! When you see this guy, you’ll stand up and then wiggle wiggle wiggle all the way back down! Ready?” Remove first wiggle worm and say, “What’s this?” and they’ll all say, “an orange!” and you move through the stack one by one. When you get to wiggle worm, shout, “Wiggle Worm!” stand up and wiggle back to your seat. Then continue on with more fruit. The fist few times will be 3-4 items and then a worm. Then mix it up and only so 2 items before a worm. Then maybe 1! The suspense is delicious and the kids will really pay attention. The beauty of this game is that it gets rid of the wiggles (literally), has them practicing listening and vocabulary, and you can adjust it to any length. 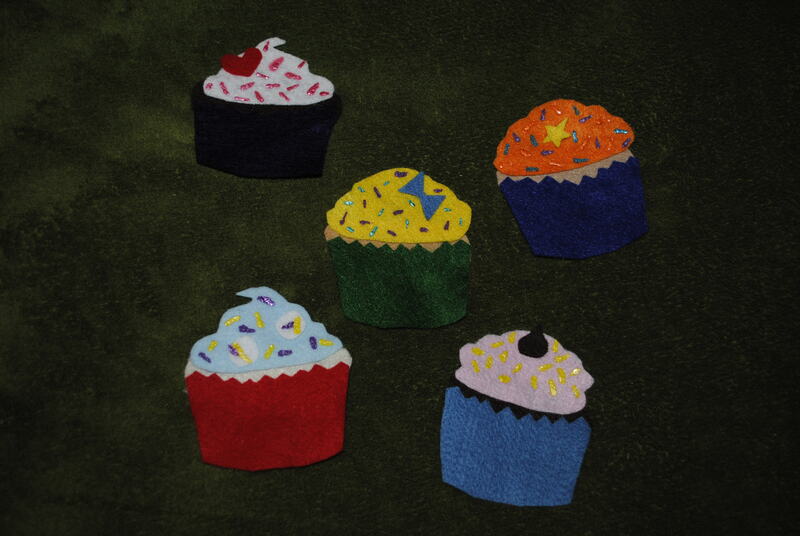 I got the 5 Little Cupcakes flannel from a Flannel Friday on Storytime Katie’s blog and used the branch Golden Retriever puppet, Hamlet, as the customer. The five little pumpkins became pumpkin pie! 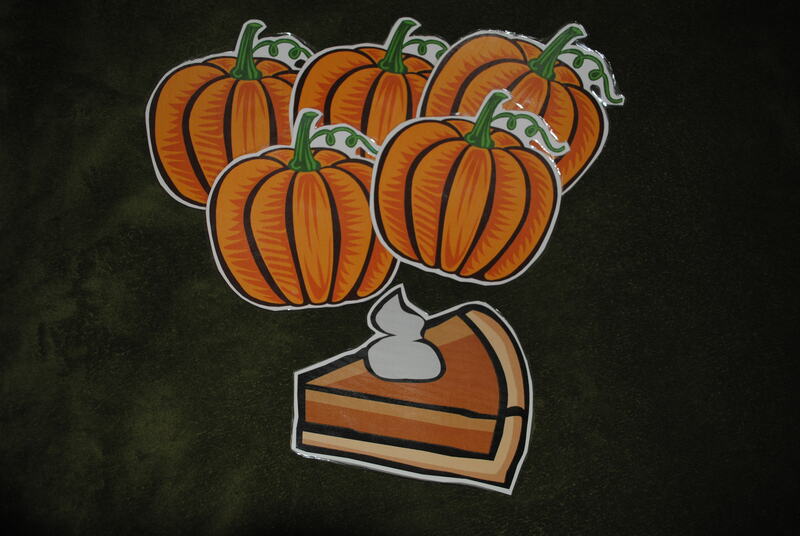 I don’t remember where this one came from but I made it in Publisher (each pumpkin took up a sheet of paper) with clip art from an internet search, printed it on cardstock on the color printer, laminated it and added velcro on the back. I love the size and the vibrant colors. Some wonderful soul donated a box of flannel stories that she created for her classroom years ago. She retired and no longer needed them so I got them! Her recreations of Denise Fleming’s wonderful book, Lunch, are amazing. Big enough for the littles to see from far away and really colorful. It is another great way to share a story with your group. Seeing it depicted in alternate way helps cement the early literacy connections in those growing brains. 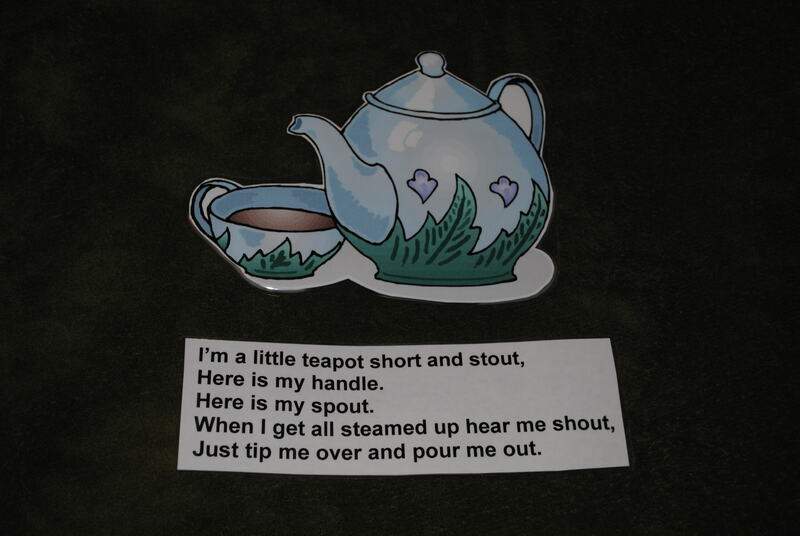 We stand up to sing I’m a Little Teapot. We sing it twice – leaning one way the first time and the other way the second. I also put the words on the flannel board just in case someone doesn’t know them. We have quite a few ESL patrons at my library. I pass out the lyrics to this song as parents are coming in to storytime and leave a pile at the back of the room. I put the graphic on the flannel board and tell the parents to get their sheets ready. It is really something to see the kids watch their parents sing with me – it is almost as if they are seeing a whole new side of them. Then we all clap enthusiastically for the parents doing such a good job. Mutual admiration society. What’s worse than finding a worm in your apple? Finding half a worm in your apple!!! 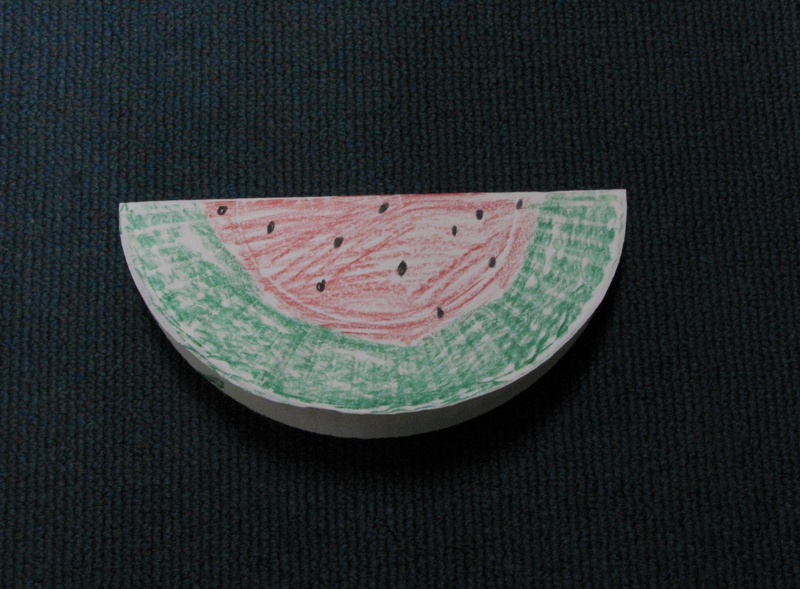 Fold a paper plate in half, color with chunky crayons and made watermelon slices. Mine are always boring red and green with black seeds but the kid’s are much more creative. Blue with purple, scribbles with a smiley face, etc. Give the kids precut circles and larger triangles and squares. Have them glue a triangle or square to a piece of paper and add circles for ice cream scoops. You can use colored paper or let them color their own flavors. Give the kids plain paper plates and crayons. Ask them to draw what they would like to have for lunch. You’ll get everything from asparagus to pizza to yams – kids are amazing. Look to my post on The Infrastructure to explain some of the closing rituals.